The combination of new sensors, deeper archives, and better computing ability make it possible to draw sophisticated information from satellite imagery. In many cases, development partners can now process imagery in the cloud without having to invest in expensive hardware and software. Many satellites capture light in wavelengths that are outside the range of human vision, such as infrared or ultraviolet light, that can help to understand the surface characteristics of the reflecting substances. Different objects reflect these light frequencies in different ways, and common satellite analysis techniques combine human-visible and invisible images (called “spectral bands”) to characterize their subjects. For example, spectral bands covering frequencies in the middle-infrared wavelength regions are responsive to moisture content in vegetation, forest canopy and soil, while near-infrared wavelength regions tend to emphasize vegetation health and— at a coarser scale— overall biomass. Taken together, the spectral response of each band creates a unique signature, referred to as its spectral curve. 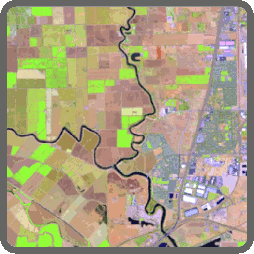 The information it communicates can help to separate different types of land cover or derive information about the conditions within a single type of land cover. A simple form of image interpretation involves assigning invisible light bands to Red, Green, and Blue channels to create a false color image, in order to highlight hidden characteristics related to those bands. False color images can distinguish muddy water from muddy land, pinpoint fires, or clearly show the extent of a growing city. The example combines the moisture sensitivity of mid-Infrared reflectance with the vegetation sensitivity of near-infrared to highlight agricultural fields.